0to300golf: Understanding Ball Flight - Why Did the Ball Go That Far? Understanding Ball Flight - Why Did the Ball Go That Far? The last two blog posts answered question 1 and 2. This post will answer question 3, why did the ball go that far? There are several factors that effect distance that the golfer has no control of. These include wind, temperature, humidity, altitude, moisture, ground conditions etc. Long distance comes from high ball speed, a high launch angle and a low spin rate. These factors can be changed by altering swing mechanics. Let's take a closer look at the factors. The factors all influence each other and it's the combined effect of all five that result in the total spin of the ball. The ball spins backwards through the air, backspin is a good thing and like all good things too much or too little can be bad!! There is an ideal range of backspin for each club, it is higher for wedges and lower for drivers. Players with lower swing speeds need higher spin rates to keep the ball in the air longer. Players with higher swing speeds require less spin. Dynamic loft is the vertical club face orientation at the center point of contact between the ball and club face at the maximum compression of the golf ball. This is basically the loft of the club at the impact point on the face. Due to vertical roll on the club face, a ball hit higher on the face has a higher dynamic loft, a ball hit lower on the face has a lower dynamic loft. In general the higher the dynamic loft the higher the spin rate. Attack angle is the vertical direction of the club head's center of gravity movement at maximum compression of the golf ball. A lower attack angle can create more spin and a higher attack angle can create less spin. However attack angle and dynamic loft together directly influence spin rate. This relationship is called spin loft. 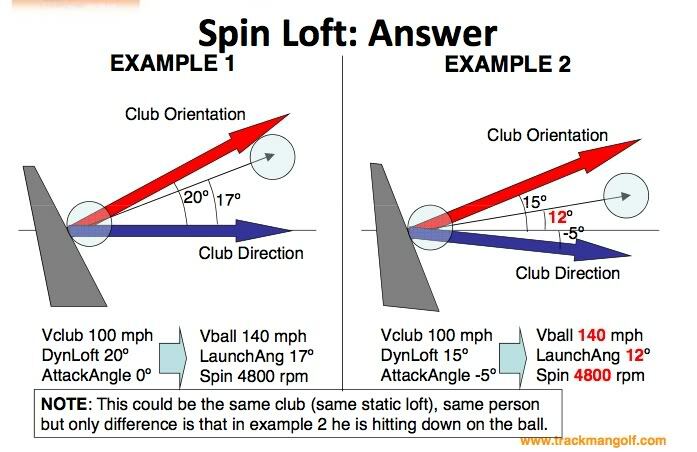 Spin Loft is defined as the angle between the direction of the club head's center of gravity movement (attack angle and club path) and the club face orientation at the center point of contact between club and ball (dynamic loft and face angle) at the maximum compression of the golf ball. In essence it is the difference between dynamic loft and attack angle, but differences between path and face can influence it as well. This picture from www.trackmangolf.com illustrates spin loft. In the two examples different dynamic lofts and attack angles produce the same spin loft and the same spin rate. Spin Rate can be calculated from club head speed x spin loft x 2.3 (driver) or club head speed x spin loft x 2.6 (iron). Impact position on the face impacts spin rates through vertical gear effect. With the club rotating around it's center of gravity, impacts above the center of gravity have reduced spin and below have increased spin. The total amount of friction between the ball and the club face will effect spin. A good example would be the 'flier' i.e. when there is grass or moisture between between the ball and club friction is reduced and the ball 'jumps' or has less spin and travels further than expected..
Higher club speeds have greater potential to generate more spin. For any given ball speed and spin rate there is a corresponding launch angle that will maximise distance. Launch Angle will always fall between dynamic loft and attack angle of the club. The dynamic loft has a greater influence. For drivers 85% and for irons 75% of the launch angle is accounted for by dynamic loft. If friction is reduced the dynamic loft can have an even greater influence. 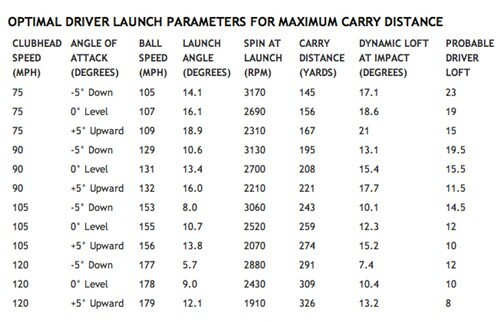 Here's a chart from http://www.planetruthgolf.com/PlayerResources/Forums/tabid/77/aft/28402/Default.aspx showing optimal launch parameters for maximum carry. Bear in mind that for maximum overall distance less carry and more roll may work better. The last factor that effects distance is ball speed. There is a relationship between club head speed and ball speed. The efficiency of speed transferred from the club to the ball is Smash Factor. If a player has 100mph club head speed and 150mph ball speed the smash factor is 1.5. The closer the smash factor is to 1.5 the better. The best way to increase ball speed is to improve center face contact. For this reason shorter shafts in drivers may be better. Shorter clubs are easier to control and as a result easier to hit out of the center of the face. The very minute loss of club head speed is more than made up for in the more centered strike with a resultant increase in accuracy. The three factors, Ball Speed, Launch Angle and Spin Rate, combined explain the distance any golf shot goes. Spin Rate is calculated by speed x spin loft x 2.3/2.6 (driver/iron). Launch angle is influenced by 85%/15% dynamic loft/attack angle for a driver and 75%/25% for an iron. Ball speed comes from club head speed with a centered contact. A high ball speed, derived from a centered strike with high club head speed, with a high launch combined with a low spin rate will mean long distance with the driver. A golfer looking to maximise their driver distance should look to improve strike and then optimise their launch conditions and spin rate. Launch Monitors such as Trackman are great tools to find the numbers to optimise your driver distance. If you get a chance to use one, do, you might end up hitting drives you never dreamed of. Other ways of increasing distance include playing in warm conditions, with the wind at your back, at altitude with dry firm fairways!! As always comments and questions are appreciated.